August offers many county and state fairs across the United States. 4-H and FFA rabbit exhibits are very popular. We hope you’ll visit the fair in your area and learn about how your own children can get involved. By August, if you’re a show rabbit breeder, your barn may be popping with very promising show rabbits entered in the fair. Oh the anticipation, and then the joy of earning those blue ribbons! August also brings dog-days of blistering heat throughout much of the northern hemisphere. Rabbit raising hits a snag if all your stock keels over in the heat! Here’s a quick reminder that rabbits like cool temperatures. 40F - 85F (5C - 30C) is ideal. It’s a rare rabbit that does not suffer at 92F (33C). Any hotter than this, especially over consecutive days, and you’re liable to lose animals to the heat unless you take strong measures to keep your animals cool. See Cooling Rabbits. We in the Pacific Northwest are beginning to think that spring will transition straight to autumn this year. The Olympic Peninsula hasn’t yet seen 70 degrees...all year! That’s okay by us - the cool weather is absolutely perfect for rabbits. Why breed rabbits? Because rabbits are an ecologically sound and renewable resource. They eat grass which the earth provides for free. In developing countries, such as Kenya and Haiti, they are an ideal source of both animal protein and income for farmers. And homesteaders around the world can get the same benefits - essential animal protein along with self-sufficiency and self-reliance. Why show rabbits? Great question. 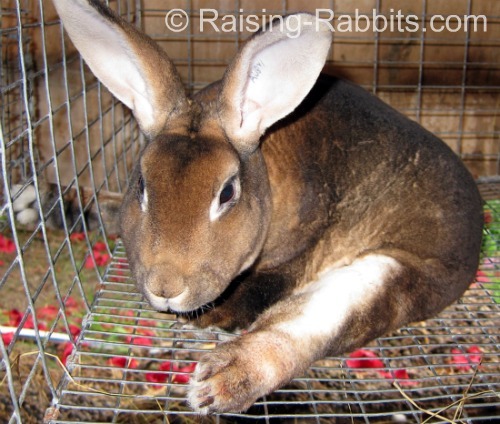 We’ll talk rabbit shows in a couple months, when temperatures cool down and rabbit show season heats up. In the meantime, you can take a peek into a rabbit show at Show Rabbit Pictures. Rabbits are surprisingly susceptible to broken backs. Being prey animals, they are timid, and startle easily. A sudden fearful kick with its hind legs is all it takes to break the rabbit’s back and render it paralyzed. Rabbits paralyzed with severe spinal cord injury are best euthanized. They may very well die within a few days due to burst bladder or a blood infection from the inability to poo. But, a broken back doesn’t always break the spinal cord. And sometimes the back may not be broken at all; just bruised. If the rabbit has any feeling in the legs, can move its legs even a little, and if it has control of its bodily functions, there may be hope of a full recovery within weeks to a few months. We’ve prepared a page of information to help you tell the difference between broke and bruised. See Symptoms of Spinal Injury for more information. The famous Calgary Stampede has just wrapped up this year’s rodeo, and the royal newlyweds, Duke and Duchess William and Kate, attended in matching white stetsons and comfortable cowboy duds...tres, tres chic! Why is this rabbit news? Check out the article - it’s well written, and has lots more great pics of those stet... er, we mean pictures of the Duke and Duchess looking terrific in those rabbit fur felt hats, heheh. Rabbit Agility and Bunny Hopping, also called Rabbit Jumping, are competitive sport in Switzerland, the UK and Skandinavia. It is also becoming more popular here in the USA as people discover such a thing exists. Your friends at Raising-Rabbits.com wish you a wonderful August.